In Style magazine, October 1998, p. ??. 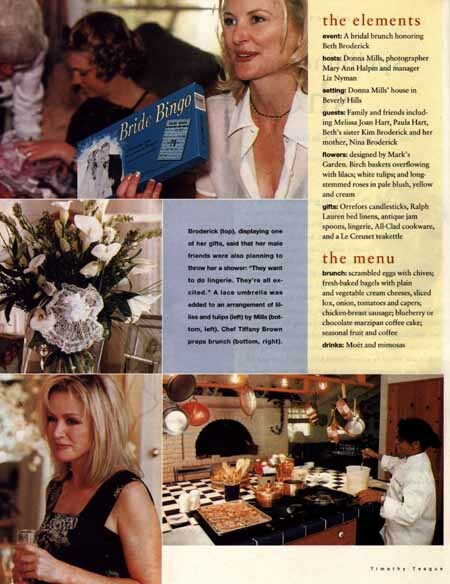 Article titled "Spellbinding Shower: Conjuring up a brunch in honor of Beth Broderick, of 'Sabrina, the Tenage Witch.'" Article features Beth Broderick's shower and mentions Melissa Joan Hart's attendence. Also noted as attending: Host Donna Mills, host Mary Ann Halpin, host Liz Nyman, Paula Hart, Kim Broderick and Nina Broderick. Melissa is in the background of the top picture.